Description: Higginsville Road, Readington Township, 1848 hours. Description: Looks like somewhere in the midwest. Description: M-MNTGFD holds at DL switch for a local to get in the yard ahead of them. 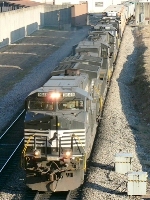 NS 2730 and BNSF 2168 are the tailing units. Description: Here comes an eastbound baretable train with a pair of NS units for power. This picture-perfect curve can be viewed from the Old Crystal Bay Road bridge over the Wayzata sub in Orono. Description: The eastbound baretable job with NS power at the disposal of the BNSF crew races effortlessly past the flow of auots going east and west on the Highway 12 bypass. The border between Orono/Long Lake is in the distance at the Willow Drive bridge. Once this train got to Minneapolis, there would be a crew change at Boom Island before the train continued on to it's destination. Title: Is This NS Country? Description: Judging by the power on this eastbound baretable job, one would think they were in NS country. Not BNSF. The train is about to duck under Old Crystal Bay road. Description: Passing by a stop signal at West Laurel. Description: A scene that was probably seen many times during the Pennsy and Reading eras, only with much, much older locomotives and different roads. Description: A look at the NS Shops in Roanoke. Description: 33Q crossing a bridge along the campus of Millikin University. Description: NS stack train 205 waits for the conductor to arrive from Prospect at Lester Ave in Johnson City. The picture had no flash, only the available lights and a timed exposure. Description: NS 205 prepares to head west from Lester Ave, as an inbound CP 39T rolls east.